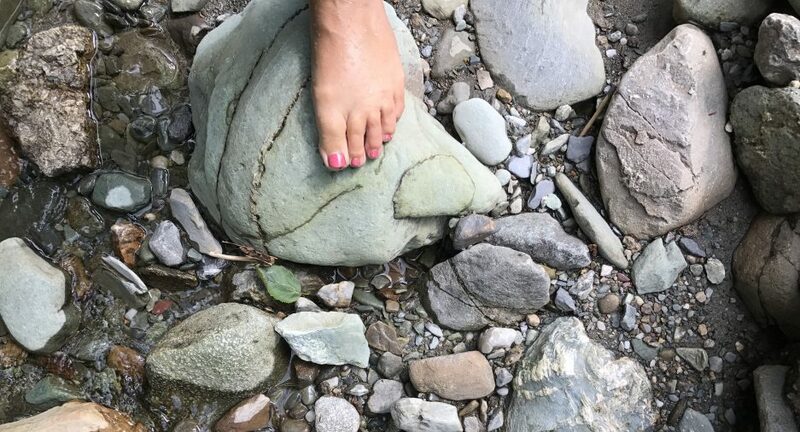 It is a five kilometre walk down our country road to the place where the gravel meets the paved highway that connects our town and the towns north of here to Vermont. My walk takes me down a less traveled dirt road and passes our field which used to grow three acres of organic vegetables but now is cut for bedding for the neighbour’s cows. It continues up the first slope with views of the stone manor house at the top of a long, winding driveway on the left. The stream that runs behind our house crosses the road here and I often stop on the bridge to watch its progress to the larger river which it joins not too far from this spot. It is usually quite a mild mannered stream but it can rage during heavy, sustained rains or when the snow cover at its source on nearby Pinnacle Mountain is heavy and spring erupts overnight instead of blossoming slowly. There is a barn at this junction and the cows are often grazing in one of the fields near the road. I often stop to talk to them or take a picture or just soak in their relaxed presence. Cows are masters of mindfulness. The sun on their backs, the grass below, and the next mouthful of grass is their meditation. The road from here hugs the Sutton River that has its source on the largest mountain in our area and joins the more majestic Missisquoi just across the border. It is along this stretch of the road that I can sometimes catch a glimpse of a family of mallards or once even an otter playing on the ice floes during the spring melt. If I am going to be joined by any human company, it is at this point where I might meet a man from town out walking his dog. And so goes my walk most days. A friend of mine who used to live close to here but has now chosen the city as her favourite place can’t really understand my fascination with walks in the country because there is no destination. That is precisely the pull for me. There is something that happens on these walks. With each footstep I come closer to something elusive that seems just out of reach. Sometimes an idea arrives on a wind current, sometimes it’s a knowing of the next right thing to do and sometimes it’s words that were stuck that spill out and have me scrambling to catch them before they disappear again. And sometimes on my walks nothing much seems to happen at all. But when I am outside taking one step after another I am able to live for a moment the Rainer Maria Rilke poem.